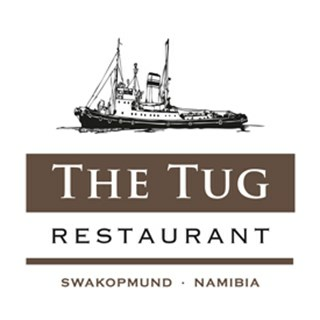 The Tug, a beachfront restaurant, is built around the original "Danie Hugo" Tug Boat in a setting with panoramic ocean views. Popular amongst both tourists and locals it has a reputation for providing meals prepared with fresh Namibian sourced products in a setting which creates an unforgettable ambience. Seating is available both indoors and outdoors on our terrace overlooking the Atlantic Ocean and the historic Swakopmund Jetty. The Tug offers authentically prepared cocktails, a selection of more than 140 South African wines, Spanish wines and French Champagne. Special delights from the Namibian ocean include wild caught West Coast Rock Lobster (seasonal), Kingklip, Kabeljou, Angel, Sole, Hake, Monk and John Dory as well as locally cultivated Oysters and fresh green seasonal Swakopmund Asparagus. For the carnivore there are tasty cuts of Beef and grilled Oryx steak. Our Head Chef recommends the home-made Chocolate Fondant, Ebony & Ivory mousse or a wide selection of home-made ice creams. For your convenience the Tug Restaurant now offers a shuttle service from and to your home. For pickup reservations call our reception on +264 64 40 2356 - pickup reservations close at 16:00 for the day. For drop off inform your server or reception in the restaurant. Posto molto caratteristico, un po’ rumoroso ma nel complesso una piacevole esperiamo con un servizio decisamente cortese e cibo di buon livello. Fantastic place, good food&wine, great people! Hope to come back one day! Very efficient and friendly team. Service, food and location was exceptional. Cannot rate the restaurant highly enough. Have brought small groups previously and will continue to do so in the future. Essen, Getränke und Service sind sehr gut. Leider hatten wir einen Tisch mitten im Raum - dadurch war es recht unruhig und laut. We were 2 families and had a wonderful meal! Very nice restaurant on the Swakopmund sea front. Delicious food and extremely good service, our waiter Marius was awesome. Also very nice and efficient booking system. It was a nice evening as always. The light above our table was not working and we had Ronald for a candle. This could have been sorted out before we arrived. Great service from Collin and fantastic table - thank you! Fantastic venue with great food and service, what more can one ask for! I booked a table many months prior to our visit and as a request asked for a table with a view. I am delighted to say we had a table with a fantastic view - thank you. Furthermore the food was gorgeous (fillet steak) and the service outstanding. The online reservation is quick and simple. We got a table at the windows, so we can enjoy the atmosphere during the sunset . The food was incredible good and the service excellent. Thank you for this great evening. Fantastic meal and service, would recommend to everyone. Was very special to go back here after a 14yr  gap. Food and service just as I remembered and a view to die for! A great evening. Keep up the good work. The Tug is sailing in the wrong direction. Much better  before! The noise in the bigger rooms, is sometimes very loud!